The days of the Bugattis, the chateau Pétrus and the fine Parisian restaurants may be over for Teodorin Obiang – at least in western Europe. The son of Equatorial Guinea’s leader is due to go on trial for corruption and money laundering in a landmark case in France. Obiang, the 47-year-old vice-president of the oil-rich but impoverished African country, faces an array of legal cases across Europe as authorities on the continent investigate the sources of his vast wealth, and uncover new and even more extravagant ways that he spent some of it. US officials have already forced Obiang to forfeit property after accusing him of “shamelessly” looting his country. In a settlement, Obiang agreed to hand over more than $30m worth of properties, including a vast villa in Malibu, California, and a dozen luxury cars. Obiang, however, managed to keep his $38m private jet and his collection of Michael Jackson memorabilia, which includes a crystal-studded glove. In Europe, Dutch, Swiss and French authorities have seized property including Obiang’s 76-metre yacht, the “Ebony Shine”, and a mansion in Paris estimated to be worth $200m. The mansion includes a cinema, spa, hair salon and sports room. Bathroom taps were covered in gold leaf while original paintings by Degas and Renoir hung on the walls. 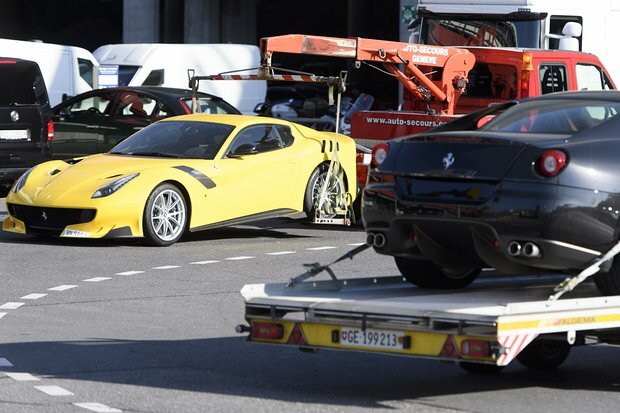 Cars seized in Geneva included a Swedish-manufactured vehicle worth $2.8m, and a $2m Bugatti Veyron. French prosecutors allege that Obiang plundered nearly $115m between 2004-11 when he was agriculture minister for his father, Teodoro Obiang Nguema Mbasogo, who has been in power since 1979. The post gave Obiang control over the lucrative timber industry. Proceeds from a so-called revolutionary tax imposed on wood sales was transferred to his personal accounts, prosecutors allege. In court on Monday, one of Obiang’s lawyers asked for the trial be suspended on the grounds that his client had not been given enough time to properly prepare his defence, having been summoned to trial just three weeks ago. “We’re not talking about a moped theft charge,” Emmanuel Marsigny told Reuters. The trial marks a major shift for France, which has long turned a blind eye to corrupt African dictators buying Parisian real estate, enjoying spending sprees in the capital or on the Coôte d’Azur, or simply fleeing to the country when in difficulty. The policy was seen as part of a wider attempt by France to maintain influence in former colonies, but also in Africa. Equatorial Guinea is a former Spanish colony. The change is in part due to evolving popular and political values, greater media scrutiny at home and abroad, and nearly a decade of lobbying by African anti-corruption and international campigners. “In the beginning, there was simply no political will in France to listen to us,” wrote one of the campaigners, William Bourdon from the Sherpa group, in September. The move by Swiss authoritiesin the Paris court to charges of laundering the proceeds of corruption, embezzlement and misuse of public funds. He has “always said he earned the money legally in his country”, Marsigny, told Agence France-Presse news agency. The defendant, who has failed with previous legal efforts to stop the trial, is not expected to attend or serve any sentence if he is convicted. Campaigners say the case will set an important precedent, and has cost Obiang’s father diplomatic capital in the region. Now the longest-serving African ruler, Teodoro Obiang Nguema Mbasogo made his son vice-president in June just after being re-elected with his usual score of more than 90% of votes cast. Born in 1969, Obiang was 10 when his father overthrew his bloodthirsty uncle, the dictator Francisco Macías Nguema. He has denied all wrongdoing and, during one of his appeals against the French trial, a lawyer acting for the French government said his client had a “compulsive need to buy”. Obiang is known to have bought a crystal-covered glove worn by Michael Jackson during his Bad tour, which is worth hundreds of thousands of euros. Its whereabouts are unclear. The US Justice Department said he “embarked on a corruption-fuelled spending spree in the United States” after racking up $300m through embezzlement, extortion, and money laundering. Equatorial Guinea is regularly criticised by human rights groups for its repressive laws, unlawful killings, use of torture and corruption. In December, Obiang’s lawyers failed to convince the international court of justice that he had diplomatic immunity and so had no case to answer in France. Obiang has denied ownership of the luxury yacht seized by Dutch authorities,claiming it belonged to his country’s government. According to specialist media, Obiang has another yacht, worth even more, in Tangier, Morocco. The life expectancy in Equatorial Guinea, Africa’s third largest oil producer, is 57 years for men and 60 for women, one of the lowest levels in the world.